The FDA is warning 40 stores, including 16 in Massachusetts, for selling e-cigarettes to minors. The Vape Shop in Boston's Brighton neighborhood was one store that received a warning. Owner Jonathan Lau says e-cigarettes are popular with minors because they're small and odorless. Students can more easily get away with it in school. Lau says he does his best not to sell to anyone underage. "Before you even step into the shop, I have about three signs on the outside of the store that say '21 plus,'" he said. "But the ones that do gain enough courage to walk in without ID, we turn them away right away." Click here for the list of 40 stores that received warning letters. Lau says he was surprised and angry after receiving a letter notifing him that his business was caught in an undercover sting selling devices like the Juul to a minor. "After we got the letter from the FDA, the thoughts running through my head were, 'We need to ramp up our age verification process,'" Lau said. Lau's store was one of 16 in Massachusetts to be warned by the FDA. Another was Mullaney's Variety in Quincy. Manager Zach Mullaney said employees will be retrained. "Just cracking down," he explained. 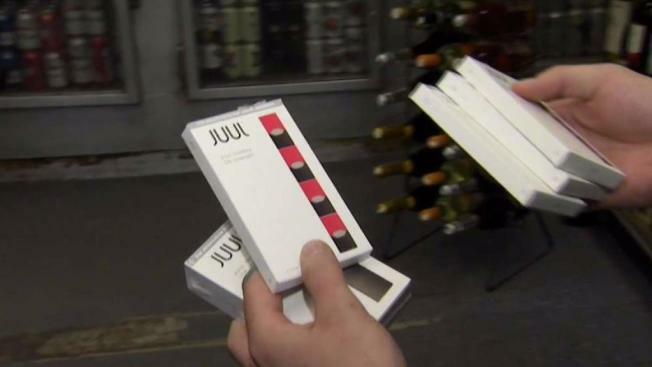 "If you sell any Juuls, make sure to ID them."